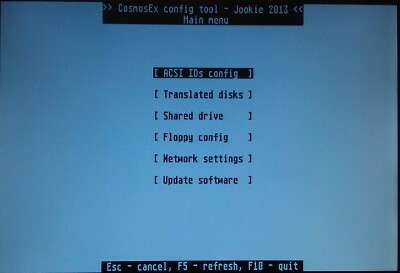 CosmosEx device comes with a tool called CosmosEx config tool. 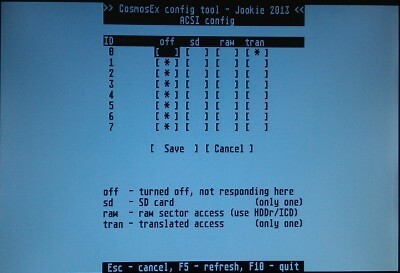 When you don’t have the device configured, it appears on ACSI ID 0, on the first boot loads the CosmosEx disk driver (CEDD) and makes drive ‘O’ available in TOS – this drive is called ‘config drive’. 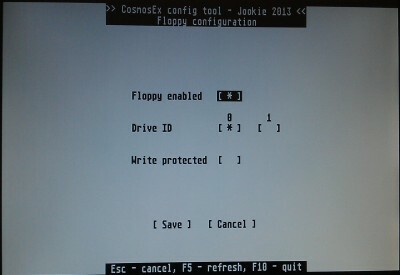 To run the CosmosEx config tool, add a drive with letter ‘O’ in your desktop, open it and run ‘CE_CONF.PRG’. 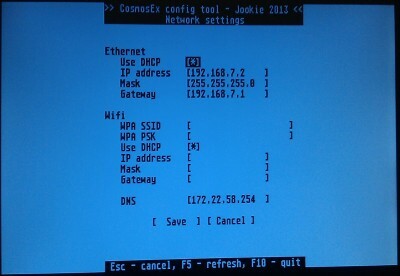 The CosmosEx config tool has a main menu which contains the items you can configure. 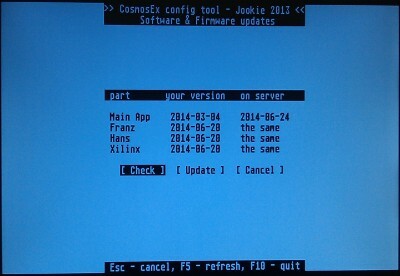 To quit the CosmosEx config tool use the F10 key. you can have only one ACSI ID assigned to SD card as there’s only SD card slot. you can have from 0 to 8 raw sector access drives (if you already used some ACSI IDs for other things, then you can have less than 8 raw sector access drives). These are used for raw sector access on any USB media you will connect to USB slot of the device, and you will need some hard disk driver (HDDRIVER or ICD Pro) to access these drives. first translated drive – you specify the lowest drive letter which will be used with translated disks, e.g. 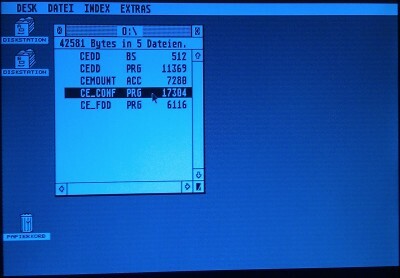 you have 3 partitions on the SD card, so they will be visible under TOS as ‘C‘, ‘D‘, ‘E‘, so you set the first translated drive to ‘G‘, and when you connect the first USB drive (DOS formatted), it will appear as ‘G‘, the next USB drive (DOS formatted) will appear as ‘H‘, and so on. This shared drive is accessible when you are using CosmosEx disk driver. The network settings are mostly self explanatory for people who – at least once – have set the network settings on their computer The wifi part hasn’t been tested, so for now use the ethernet part only. If you do have a router in your network, check the ‘Use DHCP’ checkbox and the network configuration will be pulled from that router (this is the default settings). If for some reason you want to set the configuration manually, uncheck the ‘Use DHCP’ checkbox and enter the configuration manually. This screen serves for updating your device to newer versions of software and firmware. You can see your current software versions in the column ‘your version‘, and you can see the versions available on server on the column ‘on server‘. To update all components which have newer version on server, press the ‘Update‘ button and wait a couple of seconds… You will see a downloading screen, and then you will loose the connection to the device for a while (you will see a screen saying ‘Connection lost’ or something similar). Wait few seconds (hopefully less than 2 minutes ), don’t power off your device, and the main menu of this config tool should appear again. When you go to the updates screen again, all the components should have text ‘the same‘ in the ‘on server‘ column. Please note that a working connection to the internet is needed for these updates, as the new updates are located on my web server.